Now the great indoor competitions in Gothenburg are on, Gothenburg Horse Show in Scandinavium. 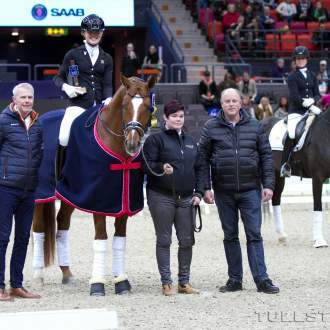 On the first day, in the first class - and the victory went to the Nursery student Ida-Linn Lundholm from Tullstorp Dressage Stable with great margin. She competed the stallion Dragon Welt by Dancier - Weltmeyer. The combination won the class with 93,4% and was rewarded with praise from the German judge Christoph Hess. Gina Tricot Grand Prix - Knytkalas and Nursery students are on their way! 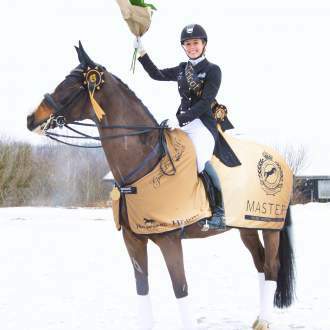 Double Knytkalas in the Cheval Medias magazine - there is also a nice article about the Knytkalas fonder and trainer Kyra Kyrklund's clinic in January at Flyinge in the latest issue of Cheval Media. Read the entire article here! - it starts on page 98.